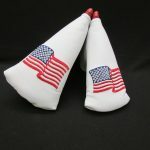 This item is part of first all-leather putter cover collection offered by HeadGear Golf. It is the first in a series of putter covers launched through an exclusive arrangement between Delilah Club Covers and HeadGear Golf. It comes with the Delilah Club Covers exclusive magnetic clasp system. Her craftsmanship is second to none! 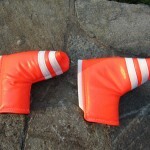 All of the HeadGear putter covers come with HeadGear Golf’s high grade leather skins.